In 2012 we decided to make a new continuo organ, which would be available for hire. It was to be of a size that could be could be divided in two, and would fit in to the back of a typical MPV car. The bottom part containing the largest pipes of the Stopped Diapason bass, and the blower. The upper part containing the soundboard, its pipes and the key and stop action. We thought that this new organ should have an Open Diapason stop in some form, with the bottom 2 octaves being borrowed from the Stopped Diapason. The organ can be tuned to A440 and A415 for use at baroque pitch. When tuned to A415, the bottom note of each stop is tuned a semitone flatter and rather than losing the bottom note, as in most such chamber organs, bottom C# is lost and the bottom note C plays as normal. 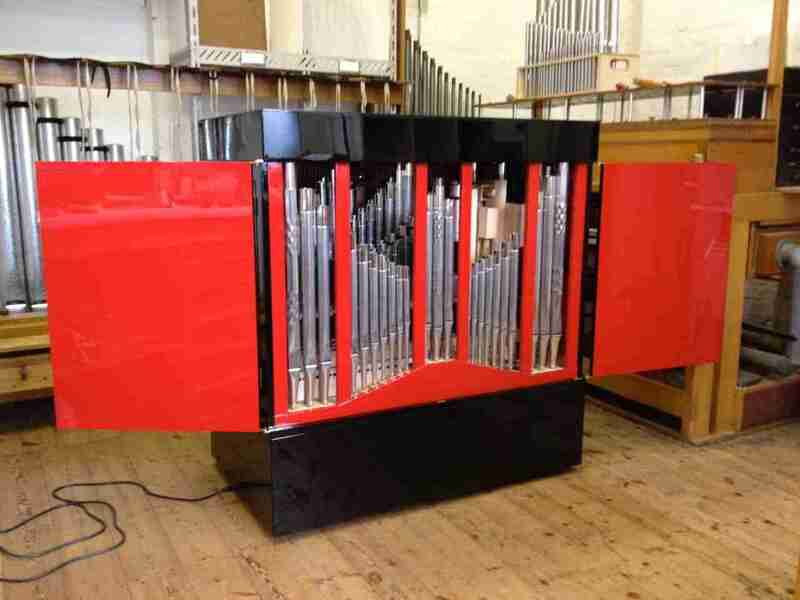 We also thought a striking case would also make the organ stand out from other “box” organs. Michael Blighton suggested a black coloured case, and Michael Köllmann further suggested it should have a lacquered finish. The resulting organ, with its bright red interior, closely resembled some Japanese Bento boxes, and the name stuck! The organ is built in conventional pine and oak, and is a worthy addition our hire organ portfolio. The organ was completed in 2013. View the Specification of the Bento organ and the pipe scales.